A report on Wednesday claims Apple looking to build a new Apple Store at the Tower Theater site in Los Angeles, a designated historic-cultural monument in the city's famed Broadway Theater District. Citing a source familiar with the matter, the Los Angeles Business Journal reports Apple is currently negotiating a retail lease for the nearly 90-year-old property located at 800 S. Broadway. Rumors of Apple's interest in the Broadway Theater District have persisted for months, though the company has not formally disclosed intent to move in. Built in 1927, the Tower Theater with its Renaissance Revival facade and Paris Opera House-inspired interior would make for a posh Apple Store. It is not clear how much space Apple is looking to lease, but the publication estimates the main theater to span roughly 7,500 square feet, while another 7,500 square feet covers the basement. The structure also contains commercial space for smaller vendors, though previous reports suggest Apple is looking to field a larger flagship outlet in the area. In 2014, unconfirmed reports said Apple was looking to transform Broadway Trade Center, a former department store just across the street from Tower Theater, into a multi-use "campus" with both office and retail space. If and when Apple opens up shop in L.A.'s storied theater district, the arrival could spark renewed interest in an area that has slowly deteriorated over the years. The main drag, S. Broadway, was once bristling with shops run by major retailers, but many storefronts now lay vacant. Previously, potential commercial owners ran into complications regarding modifications to landmarks designated by the city's Cultural Heritage Commission, a division of L.A.'s planning department. 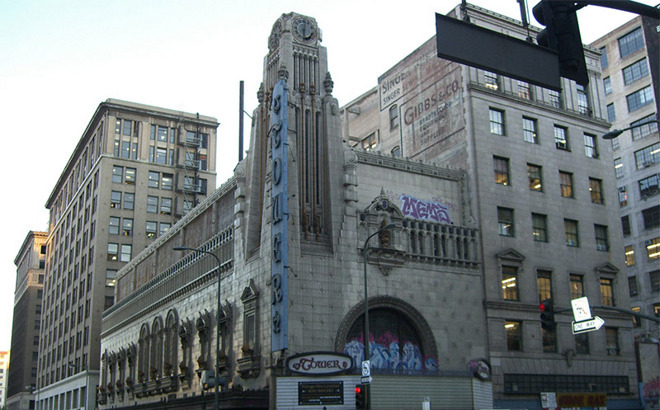 Tower Theater is protected under city ordinance, while the surrounding Broadway corridor is a National Register Historic District. In 2008, however, Los Angeles City Councilmember José Huizar launched the "Bringing Back Broadway" campaign to strike a balance between historical preservation and local revitalization. The project helped create and institute city Historic Commercial Reuse Guidelines in 2013, a set of rules designed to foster commercial development while safely reactivating historic buildings. Apple has a penchant for opening retail outlets at notable historic sites. For example, the company took over the MacArthur Chambers building in Brisbane, Australia in 2011, a 1930s era structure used by U.S. General Douglas MacArthur in World War II.